October brought together all the things I love - family, work, and friends. In addition to the usual teaching and meetings, many other things happened this month. As I write this post, I now understand why my office nook looks like it needs an overhaul, but I'm well into November, which is turning into an equally busy and great month. At the beginning of the month, Mason turned 11. 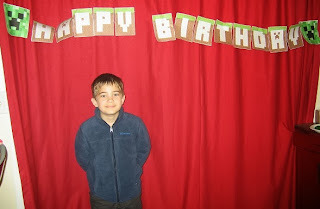 We tried to have a family party Minecraft style, thanks to The Party Animal Blog. Students attended a workshop that I gave to jump start their job searches. This year, we talked about how students could use their college years to prepare for finding meaningful work after college. The students studying professional writing at UMaine have developed a system that works. Every person who follows this system seems to find a job. Each attendee received the bones for creating a career management notebook as well as resume and cover letter writing tips. I am thinking of writing an online course that would be an extended version of this workshop for anyone who is interested in how to prepare a resume and cover letter, how to use the last year or two of school effectively to prepare for the job market, and how to interview. The second week, our family got up really early so Mason could break some boards on an early-morning news show. 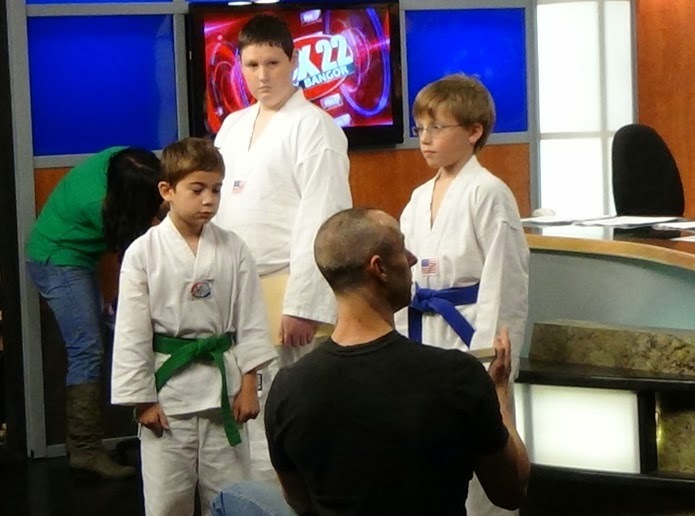 Mason and two of his tae kwon do buddies, Eli and Sean, along with their instructor, Shawn Hill, appeared in a segment of the WABI Morning Show to promote a pre-Halloween event at the YMCA. Our little daughter was along for the ride, but they needed a face to paint, so she readily offered hers. I have never been part of setting up for a promotion for a television show, so I learned a few things from that morning. My resume article came out early online. As the month rolled on, I got a message that the article I wrote, “Updating Best Practices: Applying On-Screen Reading Strategies to Résumé Writing,” came out in its online version first. I wrote a little about it in this post. I am excited about this article. I talked about the best practices in my career workshop and I plan to integrate these practices into the online course that I hope to build. I judged a pitch contest for the Big Gig. One of my favorite events of the month was getting to judge the Big Gig Pitch Contest. 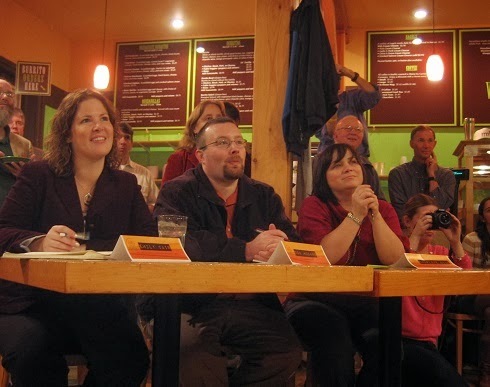 I served on a panel with Emily Cain, who is running for Congress, and Don McCann, an engineer at Environetix, which My little daughter thought I was going to sing and my son thought I was going to yell at the contestants like judges on reality shows. They were so disappointed. The winner, Sarah Newcomb hit all the right pitch notes – memorable, simple enough to repeat, and it came with a story. Another pitch-off is coming up December 10 with a training session on December 3. I volunteer for SCORE, a non-profit arm of the Small Business Administration. SCORE now has a Facebook page. This month, we'll work to start filling it up and building community for local businesses. UMaine had its 3rd Epic Fashion Show. Ava and I attended the first Epic Fashion Show when she was three. At that event, she became an accidental runway model when she was asked to walk in the show after we arrived. Now she wants to walk every year. Ava and Spencer (pictured below) have been in all three shows. The HerCampus women produce the show each year to raise funds for breast cancer research. This year’s show featured The Maine Steiners, UMaine’s all-male a cappella group. I showed Ava the article in The Maine Campus, and she thought the words of the article might be the words to the songs that the Steiners sang. We both enjoyed them a lot. I think I’ll get her their CD. We ended the month with a Red Sox World Series victory which was a big deal in our house for two reasons. First, the Sox won on game 6, which meant no game on Halloween night. Thank you, Red Sox, for getting it together. Second, since 2004, anytime the Sox or Patriots have been in the big game, they lose if Tom and I are watching the game in the same building. It was getting a little ridiculous. This year, the Sox won. We were both home. Jinx over. Unless the jinx applies only to the Pats. We'll see as football season rocks along. 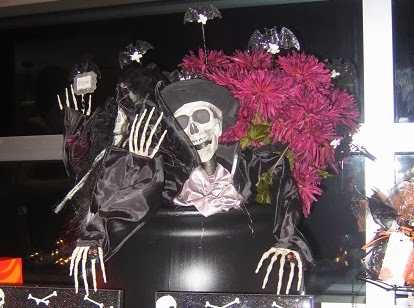 For the third year, we hosted a Halloween hub at our house, where friends could come, trick or treat, and have chili, relax. --I have ZERO pics!-- Of course, after inviting people over and promising a good time, my colleague Angela Marcolini and her fiance Mark Booth invited me to their wedding. Luckily, the moms who came to our house took over the kitchen so I could enjoy a few minutes celebrating with Angela and Matt. Definitely my first Halloween wedding! 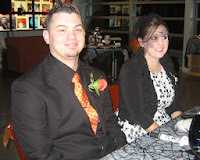 Angela and Matt met on Halloween when they were barely teenagers, so it was an appropriate night for to celebrate. What a cool night and awesome celebration. November promises to be busy. My research partner and I have a lot of raw data to dig into this month. It feels like dessert!